NXP Semiconductors (NXPI) will report their Q4 results tonight after the close. The options market is implying about a 7% one day move tomorrow which is in line with the average one-day post-earnings move over the last four quarters, but rich to the ten-year average of only 4%. Shares of NXPI have dramatically outperformed the broad market and the Philadelphia Semiconductor Index (SOX), up 27% ytd, vs the S&P 500 (SPX) up 9.2%, The Nasdaq Composite (CCMP) up 11.5% and the SOX up 15%. One reason for the relative outperformance might be the companies’ recent history, embroiled in M&A quagmire for the last couple of years, coming to a sad end late last year as Qualcomm abandoned its $44 billion bid for the company, days before the Chinese, whose opposition to the deal held it up, seemed open to approving it. The potential for a wide-ranging trade deal with China might re-ignite the take-over juices that lead to over $200 billion in the chip space in the middle part of the decade as legacy chip players looked to beef up their exposure to emerging technologies like the Internet of Things, Autonomous Driving, Artificial Intelligence / Machine Learnings and Augmented & Virtual Reality, to name a few. 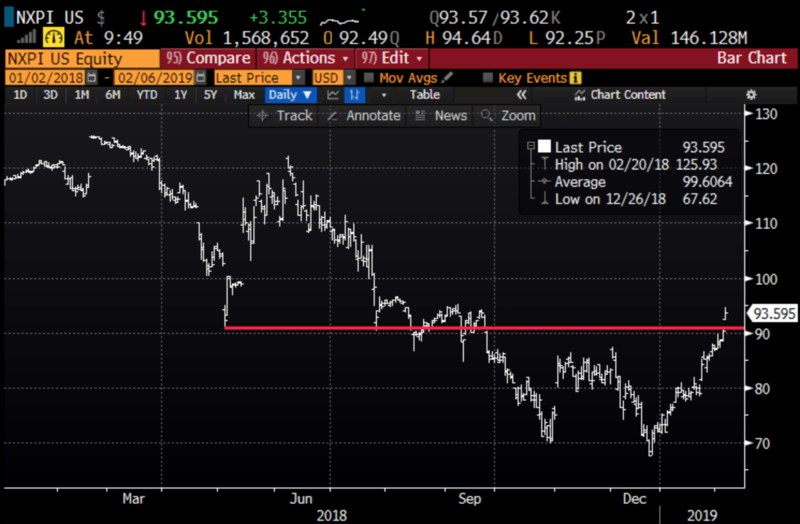 NXPI/’s exposure to industrial and automotive applications might very well put the company back in play once there is more clarity on a trade deal with China. Shares of NXPI are cheap-ish, trading a little over 13x 2018 eps that should grow at 6% when tonight’s final tally is in, but expected to accelerate to 17% yoy eps growth in 2019 on only flat 1% sales growth. 2019 eps expectation might be calling for a tad too much reacceleration. This trade performs best with a gradual move towards the 100 strike over the next week or so into Feb 15th expiration. If the stock is below 100 on Feb expiration the short 100 call will expire worthless and the trade will be left naked long the April 100 call. If the stock is close to 100 then the April 100 call should have appreciated as it will have picked up deltas. At that point it might make sense to further reduce the premium at risk by selling a higher strike call in April turning the trade into a vertical call spread. The max risk of this trade is the $1.75 in premium paid and would be at risk with a large move below the current level, or well above the 100 strike.